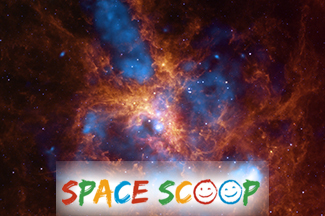 Tarantula Nebula: Super-Sized Space Spider! Don't worry if you have a phobia of spiders, it is safe to keep reading! That's because this wonderful new picture of a star-forming region called the Tarantula Nebula doesn't show the bright lines of gas that usually make it look like it has the legs of a spider. Instead, this picture gives us an unusual view of the Tarantula Nebula. Astronomers had to combine observations made with two space telescopes to create this photo. It shows the X-ray radiation given off by very hot gas (the blue parts, captured by the Chandra X-ray Observatory) and the cooler gas that surrounds it (the orange parts, taken by the Spitzer Space Telescope). The Tarantula Nebula is already big - it would take light about 650 years to cross from one end to the other - but it's getting even bigger! 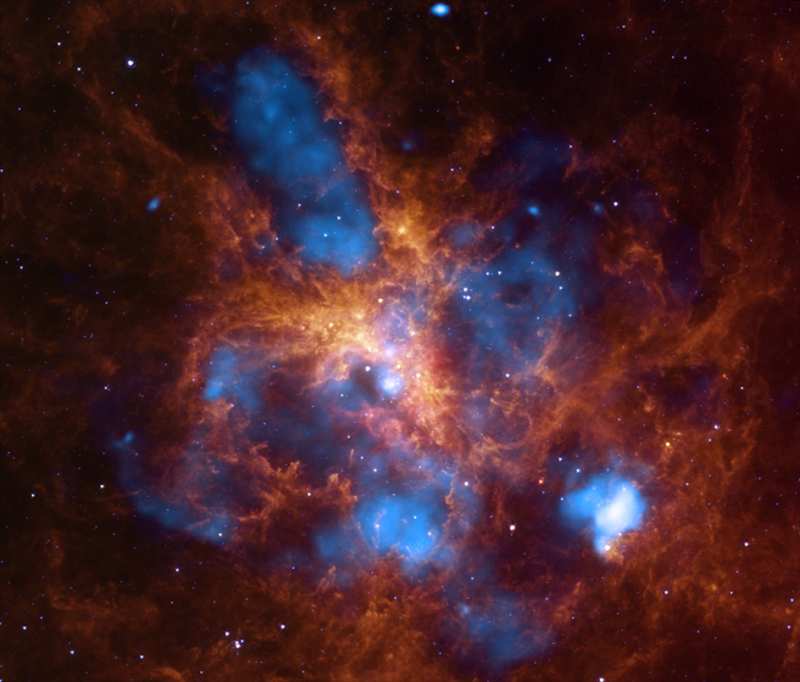 Astronomers have two ideas about what is causing the Tarantula's growth: Some astronomers think that explosions of the hot gas (shown in blue) are making it bigger, while others think that radiation from massive stars is causing the gas in the nebula to expand. To find out what is going on once and for all, astronomers need to take another look at this region. When astronomers observe the Tarantula Nebula again, they won't be looking to prove their own ideas right. All they can do is look at what their observations tell them - even if it means acknowledging that they had been wrong. Cool fact: The Tarantula Nebula contains the heaviest star known, weighing in at more than 300 times the mass of the Sun!